There are a few subjects that can be guaranteed to cause confusion and controversy. Westie grooming is surely one of them. To discuss this subject, we must make sure it is understood that we are talking about PET GROOMING. Show grooming is a whole other issue entirely. Rather than try to set down hard, fast rules that say, “Here is the only way to do it”, we are going to discuss different approaches and different circumstances. For a pet, this is strictly a matter of preference. Stripping is done on show dogs and can be done on pet dogs but is not necessary. Stripping will make the coat harder and coarser. Clipping will tend to make the coat softer and on many dogs, curlier. Many pet people clip because it is convenient. Unless you strongly prefer the look of a stripped coat, you are likely to clip or have your dog clipped. You can accomplish a very nice “Westie” look on a clipped dog if you or your groomer knows what a Westie should look like and have the information on how to accomplish this look. You can find grooming tapes and instructions on the market. If you decide to take your Westie to a groomer, we suggest you do some things to help ensure your dog comes out safely and actually looking like a “Westie”. You may want to contact your local Westie Club for information on groomers who are used by Club members. If you can’t find any, you may have to interview several groomers. Ask them questions about how they will ensure the dog’s safety. You may want to be there for the first grooming. You may want to ask for references from other customers. Many groomers will tell you that they know what a Westie should look like and when you get the dog back, it looks like a Scottie or a Schnauzer. To hopefully avoid this, ask to see a photograph of a Westie they have groomed. Take in photographs and grooming instructions. Discuss the round face (rather than square), the carrot tail, the skirt, etc. Show enough interest that they will realize that you will know if they don’t do it correctly! If they resent this, find another groomer. Understand that they will use their own shampoos etc., but that you are free to bring in your shampoo, rinses etc. if you wish. Before discussing how often to bathe a Westie, let’s talk about how to deal with Westie grooming needs between baths. This applies to Westies who are bathed 3 times a year as well as to Westies who are bathed twice a month. Your Westie should be brushed or combed daily if possible, but at least several times a week. Brushing is important to keep the scalp healthy and distribute the natural oils to create a nice, shiny coat. It will also prevent matting of the hair. Be sure to check for mats while you are brushing, especially in the “armpits”. When a mat forms and is not removed, it will continue to tighten until it finally rests against the skin. As it continues to tighten, it will create a painful irritation of the skin. The type of brush or comb used will depend largely on the type of coat your dog has. 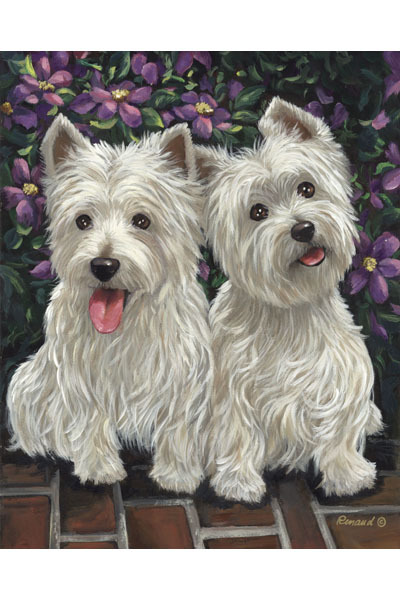 Some Westies have a very fine coat and a wide-tooth comb won’t do much for them. While other dogs have a naturally heavy coat and a flea comb will be a struggle to get through it. A lot of people find that the hair brushes with round balls on the end of each bristle gets through the coat without a lot of tugging. If you keep up the regular grooming you won’t have to deal with mats. The other issue is to comb out the undercoat so that the skin can breath. On a fine-haired dog, a flea comb will do this job. On a heavy coated dog, you will need a wider-toothed comb but you must get through the outer coat and down to the undercoat. Note: If you do get a mat, there is are products that will help remove them. One is called “COWBOY MAGIC” which is a detangler and is reported to do an excellent job of releasing the mats without having to cut the hair. Most Westies will get dirty between baths no matter how often they are bathed. It is a Westie duty to see just how dirty it is possible to get before Mom or Dad catches them. If you are lucky, it is just plain mud or dirt and not something smelly!! There are several things you can do about this without getting into a full bath. When the dog comes in from outdoors, you can train him to wait at the door while you towel dry him. Keep a towel handy for this purpose. You may also want to cover the furniture and put down a towel, sheet or some other protection at the door. These are things that can easily be removed if you have company. You can put the dog in the crate with a towel; most will come out nice and clean in a half-hour to an hour (or you can let them clean themselves on the carpet if you prefer.) Most Westies shed dirt once it has had a chance to dry. There are some that don’t shed the dirt as well as others. But give it a chance and see if this doesn’t work quite well. Note: You may still have to brush through to get the remainder of the dirt out but if you are brushing on a regular basis, this is already a part of your routine. MAKE SURE YOU MAKE THIS FUN!! Give the dog a treat and make it into a game whenever possible so that they will continue to want to come in! You can use a product on the market called a “Self-Rinse Shampoo”. This will clean that dog up very nicely. On the negative side, we suggest you avoid “doggie perfumes” since some dogs may have allergies to such items. HOW OFTEN???? This is the million-dollar question. There are a lot of circumstances to consider when trying to answer this question for your particular dog. Many Westie books and show people will give this answer. The reason for this is a belief that too many baths will dry out a Westie’s skin and cause itching problems. This is more likely to work for you if you are doing your own clipping or stripping so that you can keep the coat in shape between baths. If you are using a groomer and prefer a shorter cut, you will probably follow this schedule. Otherwise, your dog’s haircut will grow out quite long before you get him or her in for the next bath. Your dog’s medical situation: Some dogs have medical requirements (usually allergies or other skin conditions) that require more frequent bathing. If your dog has a contact allergy, for instance, your vet may suggest you bath the dog daily or 2-3 times a week during the height of the season. With contact allergies, the allergen may be resting on the skin causing the itching. Bathing is required to remove it and give the dog some relief. Other skin problems may require using medicated shampoos on a frequent basis. Oily skin: If your dog’s skin produces more than the normal amount of oil, more frequent bathing may be in order for the dog’s comfort and your sensibilities. DON’T use human shampoos unless “prescribed” by your vet. (Occasionally the vet may tell you to use a medicated human product for treatment of a medical condition. Of course, in this case, do as your vet tells you to do. ) Human products have a PH level set for human needs. A dog’s PH level requirement is quite different. Always use a product made specifically for dogs unless your vet specifically tells you to do otherwise. This discussion is intended to center on the care of the Westie Coat but while talking about grooming, we must mention one other thing. DOGS NEED DENTAL HEALTH TOO!!! Like people, gum disease in dogs can cause many other illnesses. The infections that start in the gums can migrate to other parts of the body and cause serious disease. This is why your vet always checks your dog’s teeth and gums. And many dogs need to have regular dental cleanings under anesthesia. It only makes sense that a dog should have its teeth cleaned on a daily basis just as a human does. (If daily is not possible, make sure you do this at a minimum of once a week and more if possible. It will save you dollars in the long run as you will not need to pay for as many dental cleanings and extractions over the years.) Another benefit of brushing the teeth is that it will improve “doggie breath”. You can buy doggie toothpaste and do this at home. (Make sure you do not use human toothpaste. Dogs swallow the toothpaste so the doggie versions are made to be safely swallowed; also they taste good!) If you start while they are young, they will accept and even look forward to it since the toothpaste is like a treat to them. You can use a finger cot but, if possible, try to graduate quickly to an actual toothbrush since this will provide a stronger bristle that can get below the gum line where the plaque causes problems.